Here at Ah, Whatta'bout Mimi, we rise to the occasion all the time. 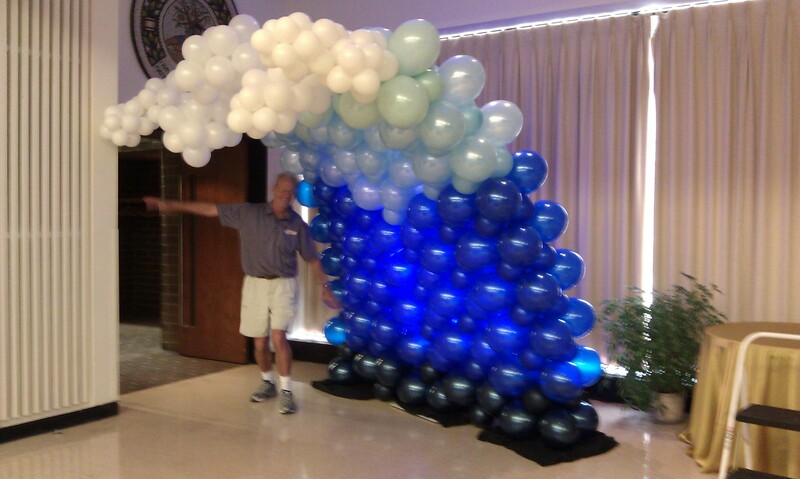 This week we were given the challenge to create an 8 foot tidal wave with balloons. This was an interesting challenge and our master balloon artists figured it all out. Now our store looks like Sea World! So this post is going to be about all the sea creatures we can create for your next event. As you can see above, we created little fishes that are swimming in the wave. These little guys can be any color and we love the challenge of trying to create them to look like different kinds of fish, as we know there are "many fish in the sea". We also created an octopus for the top of our tidal wave. This guy can be in a few different colors. Making the squiggles for his legs can be lots of fun, because we get to wrap poles to create the curled look with the balloons. It's always a challenge to get the air to go into the balloons like this, but once you get it going it is a breeze. 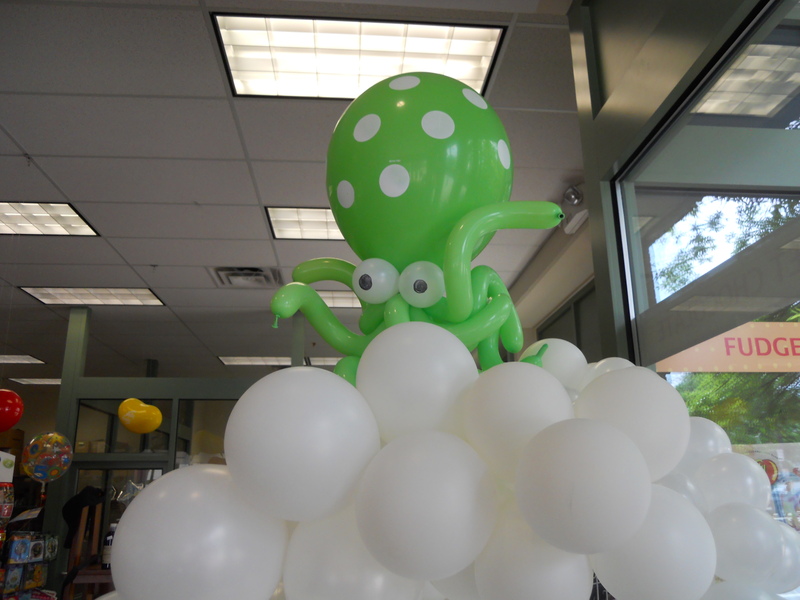 We pride ourselves in having a wide variety of foil balloons and with sea creatures there are no exceptions. We have everything from whales and sea horses, to crabs, fishes, and turtles. We added a crab to this tidal wave to give it a finished look. Plus everyone knows that there is lots of fun "under the sea". 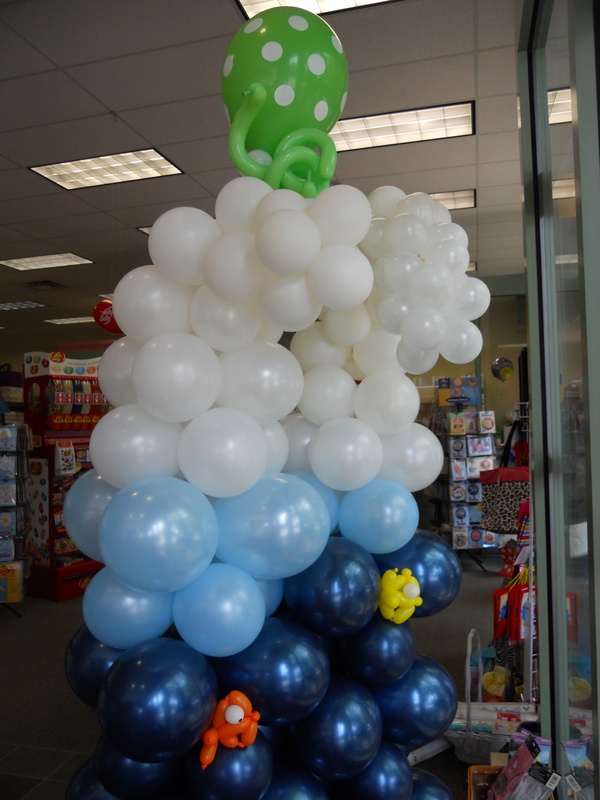 This little guy is cute and can even be the topper for any kind of balloon column or the wave itself. The actual set up of the event included a lot of balloon bouquets with beach balls on top of 3 color balloons, all filled with helium. This kind of gave it a different beach feeling, but still added to the Under the Sea theme. The whole wave looked really cool, and guests pictures were taken as they entered the party. In this way, the tidal wave served two purposes. First it was decor for the room, bringing the theme together. AND it doubled as a photo booth for guests to have a keepsake of the event and their time there. As you can see here, Jim went surfing on the wave. The waves were over 8 feet tall and when they went over they were probably closer to 10 feet. 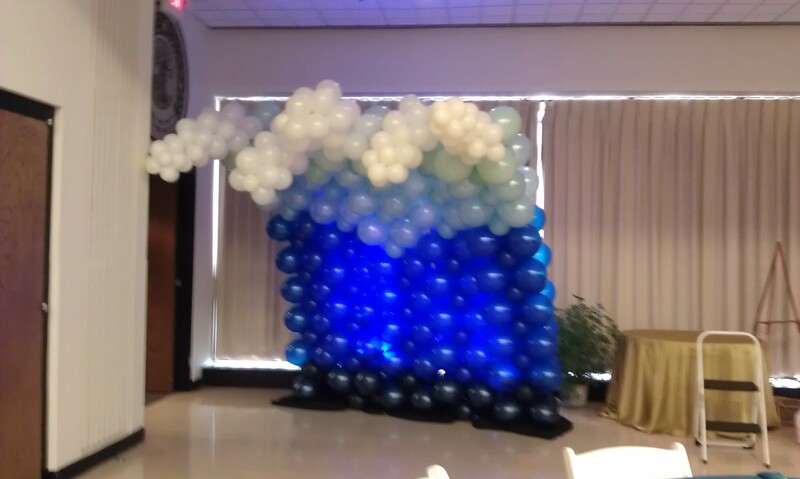 It was a really cool adventure to get to create this balloon tidal wave. And we want you to give us our next challenge! So bring your event to us, and let us create your themed decor out of balloons. Your guests will be awed and jealous! Call 502-583-4933 or visit our website at www.whattaboutmimi.com to find out more information about our different balloon sculptures.